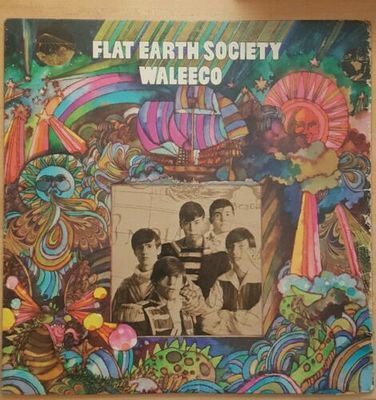 Up for sale is a copy of Flat Earth Society - Waleeco LP - Fleetwood - Rare 1968 Original 1st Press. This record comes out of my personal collection. I'm only selling this copy because I've acquired a nicer copy. This is still a nice copy! Please refer to pictures for condition, also. Sold as is. Record is shiny. Has many light rubs and lines. There are a few that cause a pop, mostly on Side 1. There is some light noise on the quiet spots but not overpowering during the music. I played thru the entire album and overall it's a strong enjoyable listen. There is light wear on the front and back.Spine and seams are strong. No splits, holes or saw cuts. Overall, there aren't many issues except there was some water damage on the open edge. I'm grading it VG knowing that it would easily be VG+ without the water damage. But please look at the closeups and make your own judgement. I try my best to describe my items but feel free to ask questions or request additional pictures. Shipping is a flat $12 via Priority Mail inside the continental US. Sorry no international shipping. Local pickup always welcome.